One of my favorite television shows is Justified, which sadly, ended this past year after 6 delectable seasons. For those not familiar, the story is centered around US Marshall Raylan Givens (played by the handsome Timothy Olyphant) with an affinity for ice cream whom returns to his place of birth in Kentucky where he fights hillbilly crime in his own eccentric manner. Hilarity ensues. There are many reasons to like, if not love, the show. I’ll share just a small handful of the reasons I adore it so. First, let’s get this out up front. Timothy Olyphant is perfection, with his swagger, Stetson and sass. You know Boyd, I’ve been there. And I bet, you have too. But lastly, and most importantly, I keep coming back to this gem for the Southern ambiance. The two lane roads, boots, cowboy hats, one-horse towns, the non-hipster yet non-grunge flannel, the dustiness, the heavy drawls full of fixin’ tos, y’alls, reckons, used to coulds, and sit a spells. I especially love when the “g” is forgotten and “o” turns into an “a”. Being on the other side of the world from my Texas roots does generate a bit of homesickness for Southern hospitality from time to time. One of the ways I scratch that itch is by chatting up a fellow Southerner, when one crosses my path. Gives my drawl an opportunity to stretch its legs after a long hibernation. Once it’s released, the muscles relax and I feel that sense of home again. When I’m feeling particularly distant and yearning for the familiar and there are no Southerners in sight, I turn to Justified. And then, like Pavlov’s dog, drool suddenly drips down my chin at the show’s first mention of food. Catfish and hush puppies. Biscuits and gravy. Pie and ice cream. Mashed potatoes. Ribs. Fried okra. Creamed corn. Pulled pork. And of course, fried chicken, which we’ve already spent some time chatting about. And thus, the hankerin’ must be satisfied. 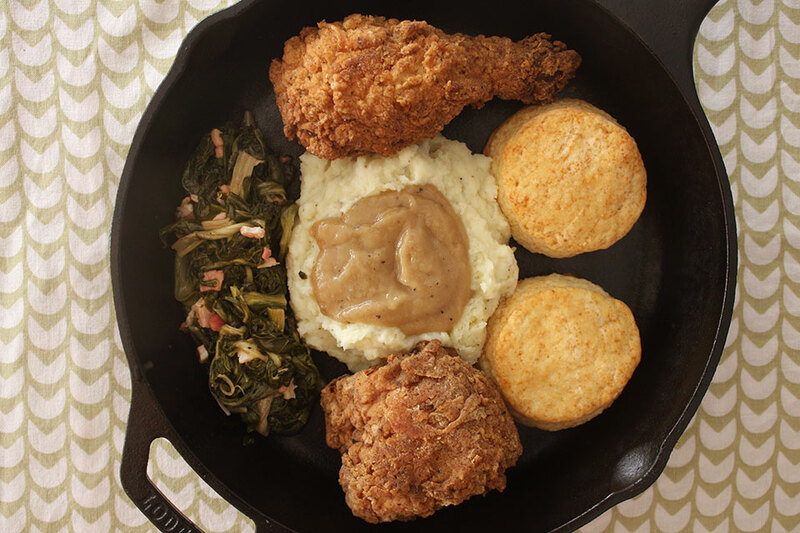 Chicken must be fried, potatoes must be mashed, biscuits must be baked. Roasted chicken gravy is mandatory, as I prefer it to the cream variety. Perhaps some greens will be cooked up too, simmered slowly with pork. Any kind of pork, because it’s pork and pork is delicious. After the first bite, I’m home again. Because for me, home is where the biscuits and gravy are. Get ready! I’ve got 3 fabulous recipes for you. Let’s do this. Preheat the oven to 375F (190C). On a large sheet pan (not lined), roast the chicken carcasses for 1 hour, turning half way through. After 1 hour, turn carcasses again then add the carrots and onions to the pan. Continue roasting for another 30 minutes or until chicken is caramelized, but not charred. Transfer chicken, vegetables and all other ingredients to a large pot. De-glaze roasting pan with red wine vinegar while it is still piping hot and scrape up all the good chicken bits. Why vinegar? Couple of reasons. Vinegar adds a great flavor to a stock. Subtle yet adds a hint of bite you can’t quite put your finger on. Also, vinegar helps draw all the goodness out of the bones much easier than without it. Add the vinegar, drippings and all the chicken bits to the pot as well. Add enough water to cover the chicken and vegetables by at least a couple inches. Simmer on the lowest flame or setting for 3 hours. Stock should never come to a boil or even a simmer. You should only see sparse bubbles floating to the top. Like Ron Popeil says, “set it and forget it”. There I go dating myself again. Yikes. After about 3 hours, the stock should be a caramelly-brown. Yes, that is a technical cooking term. Using tongs, remove and discard the chicken carcasses and vegetables then strain the stock. For a nice clear stock, I line a strainer with cheesecloth. This is enough stock for several uses. In addition to gravy, you could make at least 1 or two soups, use it to cook up rice, make a pan sauce. If not using right away, store in freezer bags. Make sure to press as much air out as you can then lie flat in the freezer until solid. Before you get started, make sure you have the stock warmed in a separate pot. Combine flour and butter in a sauce pan. Once butter is melted, whisk together with flour frequently until it begins to darken and smell nutty. This is called a roux and will help thicken our gravy. Below is what the roux should look like once done. While the stock is still hot, slowly ladle the stock into the roux while whisking to prevent lumps. After you’ve added two thirds of the stock, stop and spend a few minutes whisking the gravy to ensure there are no lumps. Add the rest of the stock then season with salt and pepper. Let gravy simmer on medium-low heat, whisking frequently, until thickened as desired, about 5 to 7 minutes. Preheat oven to 375G (190C). Combine all dry ingredients into a large bowl. Cut the butter and lard into the dry ingredients using a pastry cutter or two knives until butter pieces are size of peas. Yes, you could use your fingers, which I often recommend for scenarios such as this. However, lard is very soft and it’ll just be easier with a tool in this case. Add milk and mix just until combined. Heavily dust your counter with flour. Dump out the dough, then dust that with flour. Roll out dough to about an inch thick. Try to keep it a rectangular shape. Fold half the dough onto the other half, then roll out again. Repeat this process 4-5 more times until dough is smooth. For final roll, dough should be at least 1 1/4″ thick. Cut out biscuits using a cookie cutter (preferred) or a glass. Why is a cookie cutter preferred? This dough is leavened with layer after layer of butter and lard, which we created by rolling and folding the dough. We want to preserve those layers as best we can so our biscuit will rise nicely and evenly. If the edges of your cutting tool are dull (like a drinking glass), then the edges of your biscuit will be smashed down instead of cleanly cut, hampering your biscuit’s rise around the perimeter. Place biscuits on a parchment paper or Silpat-lined baking sheet. Brush biscuits with milk, cream or melted butter. 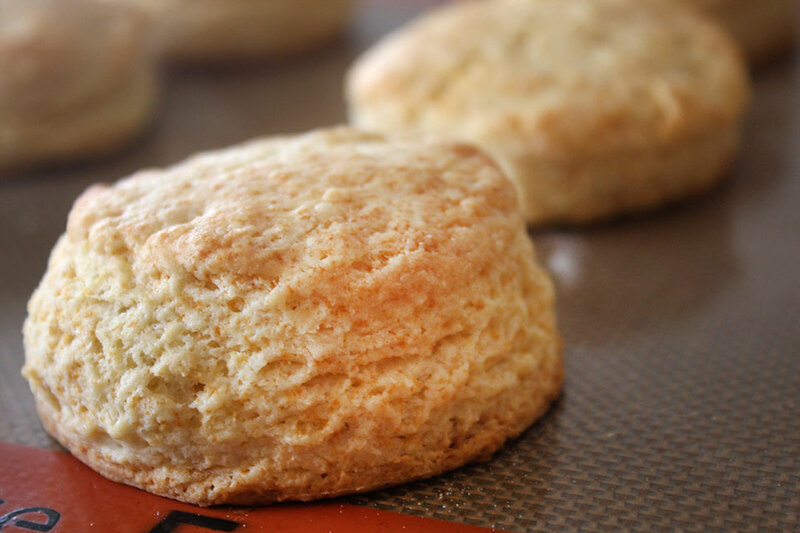 Bake biscuits for 20 minutes or until golden brown on the top. Hear are some other stock and bread recipes.